Thousands gathered shortly before afternoon prayers on Sunday in Fawwar refugee camp south of the occupied West Bank city of Hebron to mourn the death of eleven-year-old Khalil Muhammad al-Anati. Witnesses say camp residents responded to the presence of soldiers by throwing stones but that the slain boy was not involved in the confrontation. Muhammad Yusif, 21, was present when the boy was shot. He said Khalil was on an errand to buy something for his mother when an army jeep pulled up near his home and a soldier shot him in the back while he was attempting to hide. Bystanders attempted to aid Khalil but were prevented by additional live fire. “Every time someone went to get him, the soldiers would start shooting. We couldn’t reach him. When we were finally able to get to him, he had lost almost all of his blood,” Yusif said. After the jeeps vacated the area, Khalil was taken in a private car to al-Ahli hospital in Hebron, where he was treated by Dr. Mohammed Baker Abu Snaina. Video, sound and editing by Becky Anne; additional editing by Sara Anna; interview by Kelly Lynn; translation by Mustafa Alaraj and Muhanad Quaisy. The live bullet entered the lower right side of Khalil’s back and left an eight by five centimeter exit wound in his lower abdomen, exposing muscle and arteries. Doctors administered fluids before pronouncing Khalil dead shortly after arrival. The Israeli army media desk declined to answer this reporter’s queries regarding the incident. But a few hours following the shooting, the Israeli military’s Twitter account stated in Hebrew its “regret” over the incident, promising an internal investigation. According to Amnesty International’s February 2014 report titled “Trigger Happy: Israel’s Use of Excessive Force in the West Bank,” Israeli authorities have consistently failed to carry out investigations into alleged crimes that satisfy international standards. From September 2000 until June of last year, there were only sixteen military police investigations into the killings of Palestinian civilians by Israeli forces which led to indictments. None led to discharge from the military, according to Amnesty. Last year a six-year-old boy lost an eye in Fawwar refugee camp after an Israeli soldier fired a steel-coated rubber bullet at him as the child was walking with his parents. Abu Snaina reported seeing more than forty cases of people injured from live ammunition by the Israeli military in Hebron’s al-Ahli hospital over the past month. Clashes have been increasingly quelled with live ammunition since protests erupted after the death of sixteen-year-old Muhammad Abu Khudeir in Jerusalem on 2 July. At least eighteen Palestinians have been killed in the last month by Israeli forces throughout the West Bank as residents protest Israel’s latest onslaught on Gaza which began on 7 July. 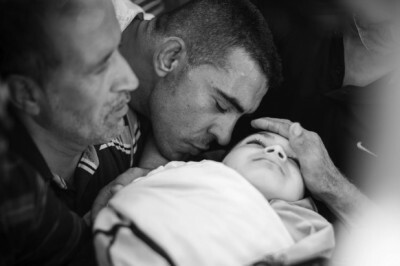 Kelly Lynn is a freelance photojournalist based in the West Bank. Her work focused on refugee communities in the southern West Bank has been published on New Internationalist, Vice, Mondoweiss and others. She can be followed on Twitter:@kellylynn194.